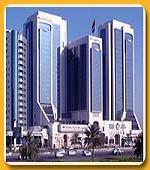 The Crowne Plaza Hotel is located in the very heart of the capital city Abu Dhabi. It is within an easy reach of the commercial and shopping districts and only 30 minutes drive from Abu Dhabi International Airport. The Crowne Plaza Hotel has 236 including 49 suites done in a tastefully decor. Each room is fitted with an air-conditioner, satellite color television, mini fridge, trouser press, safe deposit box, international direct dialing telephone and fax/modem outlets. There are also the special rooms for the non-smokers and disabled. The Crowne Plaza Hotel, Abu Dhabi features 5 fine restaurants to satiate your hunger. The Garden Restaurant on the 9th floor dishes out International breakfast, lunch and dinner. The Wok is a far-eastern styled bistro offering simple yet authentic Oriental cuisines. The Heroes Diner is a fun bar with a wide variety of delicious dishes and beverages to select from. The Cappuccino is the coffee lounge to have teas, coffees, light refreshments and baked preparations. The Crowne Plaza Hotel features a Fitness Center with a fully equipped gym, professional trainers, sauna bath and whirlpool. So there are no worries about on all play and no workouts. The Roman style rooftop swimming pool is for relaxing either in the pool or by the poolside. There is a pool bar as well for a drink or two to enjoy. Private beach is just a short walk away for water sport activities. Other facilities at Crowne Plaza Hotel Abu Dhabi include baby-sitting, beauty salon, valet service, laundry service, safe deposit boxes, private parking, currency exchange and concierge.